It is hard to pick one set of stars for a book that is full of different essays. I would give some of the essays 4 stars, others 3, and maybe even some 2s. If I look at the book as a whole, I liked it. There are a few stories that stick out -- like Santaland Diaries (about Sedaris' stint as an Elf at Macy's Santaland in NY) and Six to Eight Black Men (about how the Netherlands celebrates Christmas with "black peters"). 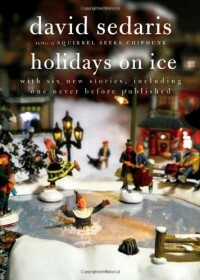 All of the stories share Sedaris' wit, and some star people who probably belong on Santa's naughty list. I enjoyed the stories that were about Sedaris and his family more than the ones that were not. Apparently this book had been released before, just with less stories. But I read the version that came out 2010.